, the type of oxonium ion produced by protonation of water. It is the positive ion present when an Arrhenius acid is dissolved in water, as Arrhenius acid molecules in solution give up a proton (a positive hydrogen ion, H+) to the surrounding water molecules (H2O). In pure water, there is an equal number of hydroxide and hydronium ions, so it is a neutral solution. At 25 °C, water has a pH of 7 (this varies when the temperature changes: see self-ionization of water). A pH value less than 7 indicates an acidic solution, and a pH value more than 7 indicates a basic solution. An oxonium ion is any ion with a trivalent oxygen cation. For example, a protonated hydroxyl group is an oxonium ion, but not a hydronium. molecule's symmetric top configuration is such that it belongs to the C3v point group. Because of this symmetry and the fact that it has a dipole moment, the rotational selection rules are ΔJ = ±1 and ΔK = 0. The transition dipole lies along the c-axis and, because the negative charge is localized near the oxygen atom, the dipole moment points to the apex, perpendicular to the base plane. Hydronium is the cation that forms from water in the presence of hydrogen ions. These hydrons do not exist in a free state: they are extremely reactive and are solvated by water. An acidic solute is generally the source of these hydrons; however, hydroniums exist even in pure water. This special case of water reacting with water to produce hydronium (and hydroxide) ions is commonly known as the self-ionization of water. The resulting hydronium ions are few and short-lived. pH is a measure of the relative activity of hydronium and hydroxide ions in aqueous solutions. In acidic solutions, hydronium is the more active, its excess proton being readily available for reaction with basic species. Hydronium is very acidic: at 25 °C, its pKa is −1.7. 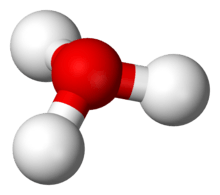 It is the most acidic species that can exist in water (assuming sufficient water for dissolution): any stronger acid will ionize and protonate a water molecule to form hydronium. The acidity of hydronium is the implicit standard used to judge the strength of an acid in water: strong acids must be better proton donors than hydronium, otherwise a significant portion of acid will exist in a non-ionized state. Unlike hydronium in neutral solutions that result from water's autodissociation, hydronium ions in acidic solutions are long-lasting and concentrated, in proportion to the strength of the dissolved acid.
) can be used interchangeably with the H+ ion; choosing one over the other has no significant effect on the mechanism of reaction. salts. For example, hydrochloric acid has an ionization constant of 107, and mixtures with water at all proportions are liquid at room temperature. However, perchloric acid has an ionization constant of 1010, and if liquid anhydrous perchloric acid and water are combined in a 1:1 molar ratio, solid hydronium perchlorate forms. 3O · (benzene)3 cation is completely separated from the anion. In the cation three benzene molecules surround hydronium forming pi-cation interactions with the hydrogen atoms. The closest (non-bonding) approach of the anion at chlorine to the cation at oxygen is 348 pm. and H2O abundances without requiring direct observation of these species. 2]2. By assuming T = 10 K for a dense cloud and T = 50 K for a diffuse cloud, the results indicate that most dominant formation and destruction mechanisms were the same for both cases. It should be mentioned that the relative abundances used in these calculations correspond to TMC-1, a dense molecular cloud, and that the calculated relative rates are therefore expected to be more accurate at T = 10 K. The three fastest formation and destruction mechanisms are listed in the table below, along with their relative rates. Note that the rates of these six reactions are such that they make up approximately 99% of hydronium ion's chemical interactions under these conditions. Finally, it should also be noted that all three destruction mechanisms in the table below are classified as dissociative recombination reactions. : the v1 fundamental band". J. Mol. Spectrosc. 196 (1): 120–130. Bibcode:1999JMoSp.196..120T. doi:10.1006/jmsp.1999.7844. PMID 10361062. ↑ Sorensen, S. P. L. (1909). "Ueber die Messung und die Bedeutung der Wasserstoffionenkonzentration bei enzymatischen Prozessen". Biochem. Zeitschr. 21: 131–304. ↑ Zavitsas, A. A. (2001). "Properties of water solutions of electrolytes and nonelectrolytes". J. Phys. Chem. B. 105 (32): 7805–7815. doi:10.1021/jp011053l. ↑ Hulthe, G.; Stenhagen, G.; Wennerström, O.; Ottosson, C-H. (1997). "Water cluster studied by electrospray mass spectrometry". J. Chromatogr. A. 512: 155–165. doi:10.1016/S0021-9673(97)00486-X. ↑ Iyengar, S. S.; Petersen, M. K.; Burnham, C. J.; Day, T. J. F.; Voth, G. A.; Voth, G. A. (2005). "The Properties of Ion-Water Clusters. I. The Protonated 21-Water Cluster" (PDF). J. Chem. Phys. 123 (8): 084309. Bibcode:2005JChPh.123h4309I. doi:10.1063/1.2007628. PMID 16164293. 2". Z. Phys. Chem. 58 (5_6): 225–245. doi:10.1524/zpch.1968.58.5_6.225. ↑ Wicke, E.; Eigen, M.; Ackermann, Th (1954). "Über den Zustand des Protons (Hydroniumions) in wäßriger Lösung". Z. Phys. Chem. 1 (5_6): 340–364. doi:10.1524/zpch.1954.1.5_6.340. ↑ Marx, D.; Tuckerman, M. E.; Hutter, J.; Parrinello, M. (1999). 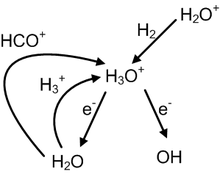 "The nature of the hydrated excess proton in water". Nature. 397 (6720): 601–604. Bibcode:1999Natur.397..601M. doi:10.1038/17579. ↑ Markovitch, O.; Agmon, N. (2007). "Structure and Energetics of the Hydronium Hydration Shells" (PDF). The Journal of Physical Chemistry A. 111 (12): 2253–6. doi:10.1021/jp068960g. PMID 17388314.
aq) in Water". Journal of the American Chemical Society. 132 (5): 1484–5. doi:10.1021/ja9101826. PMC 2946644 . PMID 20078058. 1 2 Rauer, H (1997). "Ion composition and solar wind interaction: Observations of comet C/1995 O1 (Hale-Bopp)". Earth, Moon, and Planets. 79: 161–178. Bibcode:1997EM&P...79..161R. doi:10.1023/A:1006285300913. 3". The Astrophysical Journal. 483: 531–540. Bibcode:1997ApJ...483..531V. doi:10.1086/304242. ↑ Neufeld, D. A.; Lepp, S.; Melnick, G. J. (1995). "Thermal Balance in Dense Molecular Clouds: Radiative Cooling Rates and Emission-Line Luminosities". The Astrophysical Journal Supplement Series. 100: 132. Bibcode:1995ApJS..100..132N. doi:10.1086/192211. ↑ IUPAC, Compendium of Chemical Terminology, 2nd ed. (the "Gold Book") (1997). Online corrected version: (2006–) "heavy water". ↑ Herbst, E.; Green, S.; Thaddeus, P.; Klemperer, W. (1977). "Indirect observation of unobservable interstellar molecules". Ap. J. 215: 503–510. Bibcode:1977ApJ...215..503H. doi:10.1086/155381. and its Relation to the O2 and H2O Abundances". The Astrophysical Journal. 399: 533. Bibcode:1992ApJ...399..533P. doi:10.1086/171945. hdl:1887/2260. ↑ Herbst, E.; Klemperer, W. (1973). "The formation and depletion of molecules in dense interstellar clouds". Ap. J. 185: 505. Bibcode:1973ApJ...185..505H. doi:10.1086/152436. ↑ Schwarz, H.A. (1977). "Gas phase infrared spectra of oxonium hydrate ions from 2 to 5 μm". J. Chem. Phys. 67 (12): 5525. Bibcode:1977JChPh..67.5525S. doi:10.1063/1.434748. ↑ Wootten, A.; Turner, B. E.; Mangum, J. G.; Bogey, M.; Boulanger, F.; Combes, F.; Encrenaz, P. J.; Gerin, M. (1991). "Detection of interstellar H3O+ – A confirming line". The Astrophysical Journal. 380: L79. Bibcode:1991ApJ...380L..79W. doi:10.1086/186178. ↑ Goicoechea, J. R.; Cernicharo, J. (2001). "Far-infrared detection of H3O+ in Sagittarius B2". The Astrophysical Journal. 554 (2): L213. Bibcode:2001ApJ...554L.213G. doi:10.1086/321712.